In Nairobi 40% - 60% of all trips are by foot and 1% - 3% of trips are by bicycle (Nairobi City County Government 2015; Mitullah and Opiyo 2012). Despite the high percentage of trips by non-motorized modes, there is little investment in walking and cycling infrastructure. Pedestrian fatality and injury rates are high and much of the existing infrastructure is inaccessible to people with limited mobility. Prioritization of non-motorized transport (NMT) is low compared to motorized modes of transport and NMT infrastructure is often insufficient for the needs of the users. 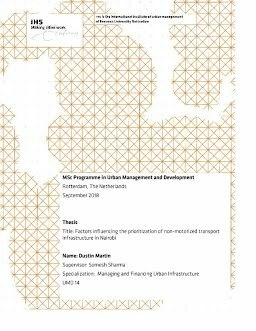 This thesis explores the factors that influence the priority of NMT infrastructure in Nairobi, focusing specifically on walking and cycling infrastructure. Furthermore, the thesis attempts to explain how various factors influence the priority of NMT infrastructure. A case study approach was used for this research. Qualitative data for the research was collected through key informant interviews with respondents that were involved in the NMT sector in Nairobi. In total 12 respondents were interviewed from a variety of backgrounds. The respondents were grouped into four different categories based on their professional backgrounds: 1) Academia; 2) Civil society; 3) Donors; and 4) Private consultant. The data collected from the respondents was used primarily to gain a better understanding of the factors that influence the priority of NMT infrastructure in Nairobi. The research methodology also included document analysis to collect data on the level of priority of NMT infrastructure. Priority was determined by the type of planning for NMT infrastructure found in policy documents and the financial allocation given to these projects in budgeting at the municipal and national level. Some of this data was supplemented by qualitative data from respondents as it related to NMT prioritization. The findings suggested that there were six factors that influenced the prioritization of NMT infrastructure in Nairobi: 1) Appraisal mechanisms; 2) Cultural attitudes towards NMT users; 3) Inter-agency coordination in transportation planning; 4) Politics and governance; 5) Social advocacy; and 6) Training of technical staff at implementing agencies. In the conclusion the thesis offers some recommendations, based on the findings, for increasing the priority of NMT infrastructure in Nairobi. For increasing the prioritization of NMT infrastructure some of the key recommendations were: 1) Improve data collection techniques for NMT infrastructure and NMT users to better understand the economic, environmental, and social costs and benefits of NMT; 2) Improve the awareness of the general population on the benefits of NMT; 3) Use reliable data to show decision-makers the quantifiable costs and benefits of investing in NMT infrastructure; 4) Unify advocacy groups around specific and detailed NMT goals and objectives; 5) Better coordination of NMT design guidelines and NMT policy between implementation agencies; and 6) More training for personnel in implementing agencies on NMT user preferences and inclusive NMT design.